It has been some time since I profiled a food company so this week I am looking at Village Farms International Inc. (“Village Farms”). Village Farms has been in operation for 30 years and operates seven greenhouse facilities in British Columbia and Texas. It is one of the largest producers of greenhouse tomatoes, bell peppers and cucumbers in North America. Interestingly, the produce is grown hydroponically, without the use of soil in glass enclosed, monitored environments. It is the sole grower of mini San Marzano tomatoes in North America. 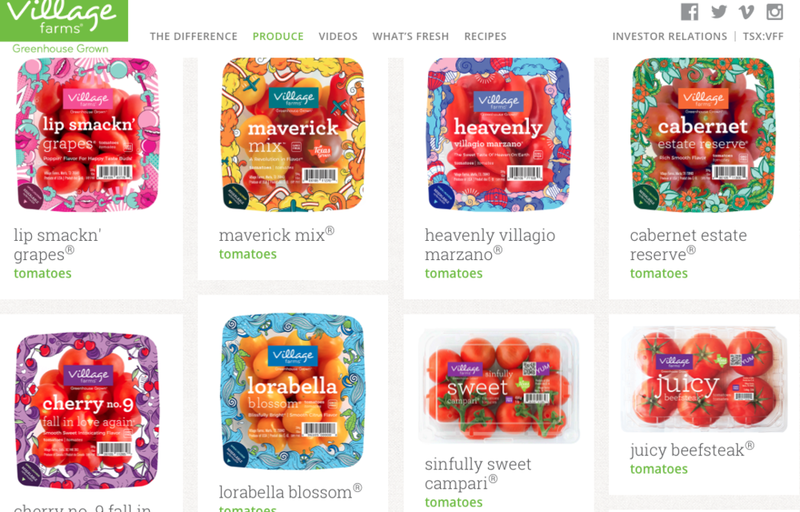 I see Village Farms produce regularly at my local supermarkets so I was interested in learning more about this company. Village Farms has more recently been in the news for its strategic decision to enter the cannabis and hemp industry. It now has 1.1 million square feet of greenhouse operations dedicated to cannabis production in Canada with an addition 3.7 million square feet available for production. With one of the largest greenhouse operations in the US, it also has substantial space in the US available if or when cannabis becomes legal throughout states in the US. In this vein, Village Farms announced this past July that is now has a 50% ownership, along side Emerald Health Therapeutics, in Pure Sunfarms Corp, which is set to become one of Canada’s largest vertically integrated cannabis companies. Pure Sunfarms Corp. is operational and currently selling dried cannabis to Emerald Health Therapeutics. Pure Sunfarms Corp. went from selling and growing tomatoes in one of Village Farms’ greenhouses to growing and selling cannabis in just seven months. Village Farms had revenue in 2017 of $206 million with EBITDA (earnings before interest, tax, depreciation and amortization) of $9.6 million. Clearly, Village Farms is uniquely positioned, unlike almost any other company given its extensive greenhouse experience, to make a seamless transition to the lucrative cannabis market. · As stated many times on this site, I, nor ZSM Creative Inc. operating as The Capital Pink, are financial advisors and have no financial accreditations. I am applying some basic evaluation tools to this stock along with some commentary, but this should only serve as a starter for your further research. The information below is only current to the day this post was written which may or may not be the same day as this post was published so please update the ratios and numbers to the current day before relying on them as they may have significantly changed (see How Do I Evaluate a Stock? (Part One) for information on where to find the ratios and numbers online). Please read my Legal Disclaimer. Also, I do not own Village Farms International Inc. stock and am not affiliated with them in any manner. What is Village Farms stock doing? One share of Village Farms would cost $6.26. The price over the past 52 weeks has ranged from $4.05 to $9.80. So, it is trading in the middle of that range. Recall this is the stock price divided by the earnings per share. If the P/E is high, you should expect to get some growth for having paid a bit more for the stock however, it could indicate the stock is overvalued. This is a reasonable P/E ratio which suggests you are not overpaying to a large extent for each dollar the company is earning. It would be ideal if you could compare the P/E ratios to other companies in this industry although the forward P/E of the S&P/TSX is 13.6 so Village Farms is close to that metric. Dividend paying stocks are something many investors look to buy as they are like an interest rate on your shares. Dividend payouts are discretionary. Dividend yield represents the amount the company pays out in dividends relative to its share price. While a higher dividend yield is usually more desirable, you still need to consider the health of the underlying company before making a generalization either way. Village Farms is not paying a dividend at this time. This figure will tell you a great deal about the growth of the company. It takes what the company earns and divides it by the number of shares outstanding. It is essentially the profit allocated to each share of the company. The bigger the number the better because the more the company earns, the more attractive it is to investors. EPS that is increasing every quarter shows earnings momentum and shows growth potential. Village Farms is reporting a negative EPS in its financial records for the last six months hence the negative figure above. Increasing revenue is a good sign that the company is growing. Village Farms has generally had increasing revenue which is a good indicator of growth. It will be interesting to see if the addition of the cannabis stream of income will boost revenue substantially. ROE tells you what sort of return the company is getting on the shareholders money. An increasing ROE is a good sign. ROE is net income divided by shareholder equity. Again, with Village Farms reporting negative income, this figure is negative. Recall that small cap stocks usually have the most room for growth as opposed to large, established, stable large cap companies and medium fall somewhere in the middle. Village Farms would be considered a small cap stock. This ratio compares the total market value of the company with its sales revenues. There is not a great deal of manipulation a company can do with its sales data, so this can be a good indicator of how well the company is doing. Recall that a lower ratio relative to its peers in the industry can indicate a potentially good investment opportunity. Morningstar indicates the industry average is 2.9 so Village Farms being lower than that may signal a good opportunity with further research. Having cash left over after expenses are paid off is crucial to remaining in business so this is a good indicator about the health of a company. Generally lower is better as it could indicate the company is obtaining large cash flows not yet reflected in the stock price. The Price/Cash Flow ratio of the S&P/TSX is 8.0 for comparison. Village Farms likely has negative cash flow and that would explain the absence of a figure. In addition to its successful produce greenhouse operation, the entry into the cannabis space is a big opportunity for which Village Farms is extremely well suited. The joint venture has taken its toll on costs and expenditures but given Village Farm’s track record in the greenhouse business, it is well poised to get costs in line for a profitable cannabis business. Its large amount of greenhouse space, particularly in the US, allows it to hit the ground running if or when cannabis is legalized more widely in the US.